Ailish Hooper is the poet and teacher hosting me while I’m teaching and reading poetry in Baltimore. Having taught a morning poetry workshop with her students, she drives me to DC, which is an hour away. It’s a hot day and Electric Vibrations by Tribe Called Quest is playing on the radio. I'm excited to visit the world's only Deaf university. I'd read about its history in the book 'Seeing Voices' by Oliver Sacks. We reach Gallaudet University at 2pm where Christopher, a large man with the presence of a friendly bull greets us. He notices my hearing aids instantly and asks if I sign ASL (American Sign Language)? I tell him I’m level 1 BSL (British Sign Language) he shrugs, says “We won’t understand each other, I’ll type on my phone”, I look at Ailish as if to say, Should I tell him that isn’t necessary because I’m hard of hearing rather than profoundly deaf? But he’s already typing his name in the notes section of his phone and walking us towards the statue of Gallaudet. 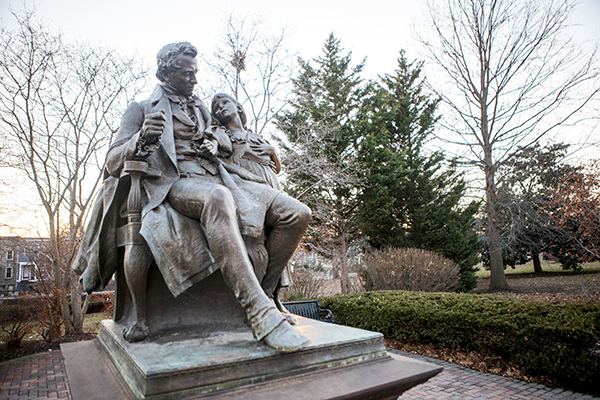 He types in the history of the campus, the significance of Edward and Thomas Gallaudet, then hands it to me – There’s a slight wind blowing into my hearing aids which muffles everything, then I’m moved by Christopher’s consideration for me. People usually assume my hearing is better than it actually is and I end up feeling a pressure to uphold that impression. Some people have told me I have a “nervous energy” but it’s usually because those people have voices I struggle to hear, but with Christopher typing I don’t have to make that extra effort to lip-read or fill in the blanks of our conversation. As he hands me his phone with all the information in text I instantly feel a rare kind of relief. Christopher guides us onto the campus and types, “Do you have these video booths in the UK?” He sits in the booth and explains how deaf people call a operator on the screen, then the conversation can be signed or captioned, he points at the buttons and waits for my eyes to meet his face and says “this is how the deaf can speak to anyone” and this is when I’m hit with my own memories of telephones, how it was not hearing their shrill ringing that diagnosed my deafness – I think of all the times I was nervous to call the bank or the cinema knowing the operator wouldn’t speak clearly or loud enough, I think of the black clunky rubber pads I had to put on the phone receivers so I could speak on the phone with my hearing aids in, how I would push the receiver so hard into the side of my head trying to hear the operator the pads marked my skin and left my ears burning bright red. I excused myself, trying not to weep. I thought of the stories head teachers in deaf schools had told me about some parents who are ashamed of their child’s deafness, how they spoke like grieving parents, begging them to “make my child speak”, then I sobbed audibly thinking of the stories I’d heard about the isolation some deaf elderly people experience, how long they have to wait to speak to a GP with an interpreter, tears stream down my face and I’m embarrassed. Christopher asks if I’m ok, I’m not able to explain in the moment why I’m crying, why I’d never seen anything like this in a public setting before, but Christopher doesn’t make a big deal out of my tears. He leads me and Ailish to the bookshop and I’m standing in an aisle among books, mostly written by D/deaf authors on teaching, learning sign, deaf literature, history and poetry, and it hits me again, other memories of feeling alone in my condition, completely unaware there was a library of people who share a version of my experience. Ailish puts her hand on my back, seeing how overwhelmed I am, crying like a lost child in a new home. I pull myself together and select what books to buy. It’s easy to glorify this as a D/deaf paradise at this point, to think that I would’ve flourished in this environment – that the inferiority I felt because I couldn’t keep up with what was said at school or at home, but I doubt this to be completely true. I recognise this is also an elite and competitive school to get in to. There is still a hierarchy within Deaf culture, with people who can sign fluently in multiple languages, with people who have access to travel and greater education and those who don’t. In the UK, class, race and education play out in the D/deaf world as it does in the hearing world. How you articulate yourself indicates (sometimes inaccurately) your social status and what opportunities and conversations are open to you. Christopher confirms this tension, he types, “it’s great but still not perfect here, there’s still issues of students feeling isolated and undermined because there’s a pressure to be high achieving”. Christopher takes the phone back and types “also many executive decisions are still dictated by non-signing hearing people who do not share the needs and experiences of D/deaf people, there’s a long history of students fighting for Deaf rights and to be taught by other D/deaf people”. After we’re led through the “Deaf Space corridors” and told about how performing ASL poetry is a rites of passage in Gallaudet, that students are given poetry anthologies by Deaf poets and are asked to learn a poem to perform to other students. Many students have a story about the poem they choose and their experience performing it to a crowd. Christopher tells us that as a student he’d stand on the table in the cafeteria and perform poems to his friends huddled around him. Christopher drives me and Ailish out of Gallaudet, he recommends a Mexican restaurant about a mile away. At every traffic light he types summaries of each road “this part of DC is black and has lots of poverty” then we’d get to the next block “this part is nice, look at the tall houses and wide green lawns”, then another block “lots of gentrification and tension here” and then another block “when Martin Luther King was murdered this part of DC was the first to erupt in flames and riots. People lost their lives. Cars turned upside down. Houses burned.” And that image stayed with me, a city vibrating with fire and turmoil and right in the middle of the flames, the world’s only university for the Deaf.